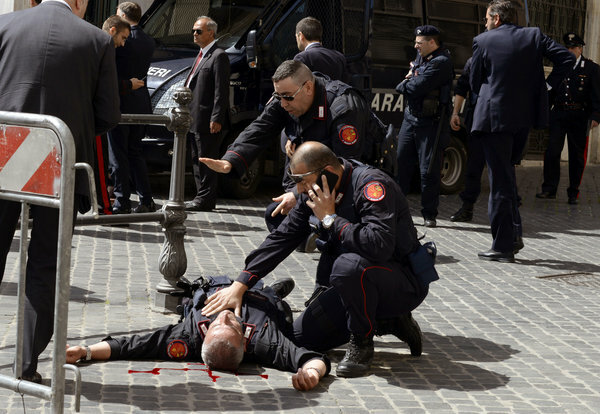 Gunfire was heard in Rome on Sunday, April 28, 2013. The targets for the assassination attempts were politicians. The victims were police officers. The suspect appears to have been a self-styled "warrior." 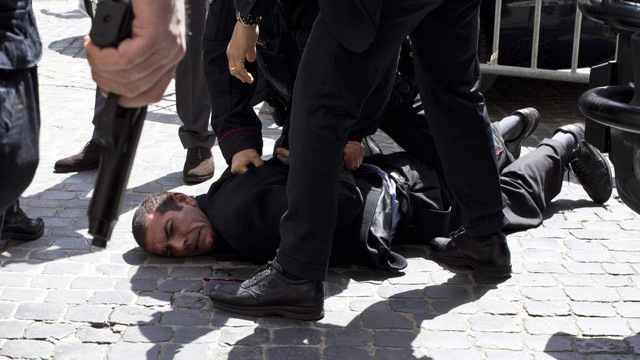 As ministers in Italy's new left-right coalition cabinet were being sworn in, a lone gunman attempted to get to the politicians to shoot them. Frustrated in his efforts, the shooter turned the gun on law enforcement officials, the Carabinieri. One officer was wounded in the leg, and another in the neck. A pregnant woman passerby was grazed by a bullet. None were seriously injured, apparently. The ''desperate" gunman had ''lost work, had lost everything" ...[and] "wanted to shoot politicians, but given that he couldn't reach any, he shot the Carabinieri" police at the edge of Chigi Square. News Observer. The rightwing mayor of Rome, Gianni Alemanno, said: "We shouldn't be surprised at a time when people are inveighing continually against the establishment." Though he denied that it was aimed at any one group, Alemanno's remark was widely seen as a reference to the maverick Five Star Movement (M5S), which has bitterly attacked Italy's mainstream parties. Beppe Grillo, the ex-comedian who leads the M5S, condemned the shooting. 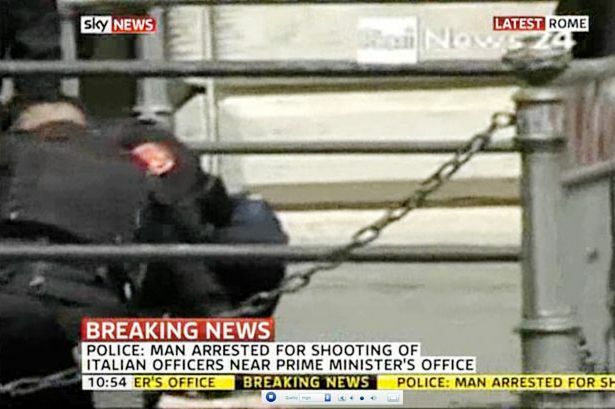 The suspected gunman was wrestled to the ground and disarmed by Carabinieri as he tried to flee. 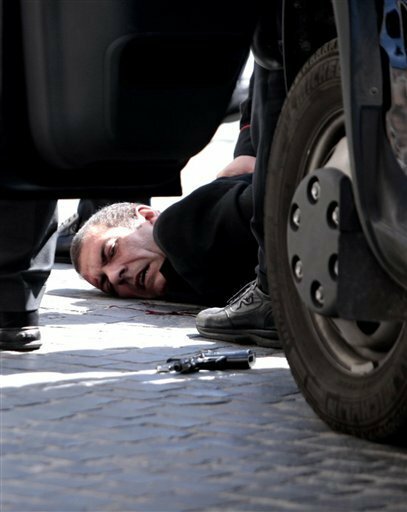 He was named as Luigi Preiti, a man in his late 40s from the mafia-ridden town of Rosarno, in Calabria. He was initially described by the authorities as mentally disturbed, but his brother, Arcangelo Preiti, said: "Until yesterday morning, Luigi was a lucid and go-ahead person." He said his brother, who has a son, had returned to Calabria from the north after losing his job and separating from his wife. Preiti, who was dressed in a jacket, collar and tie, was said not to have any links with organised crime. Forensic officers reportedly found seven bullet casings in the broad, paved square in front of the prime minister's official residence. Guardian. The suspect's name Luigi Preiti has an intriguing literal translation. The meaning of Luigi is "famous warrior." Preiti is a name, usually of Indian/Hindi origin, which means "switch." Nothing has been noted about his ethnicity, and he is being discussed merely as "from Calabria." 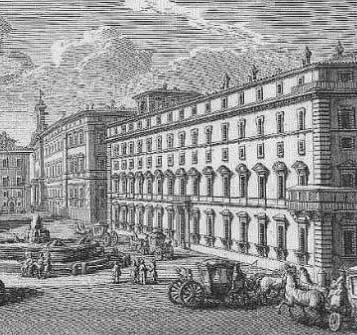 The swearing in was occurring in the Palazzo Chigi, the prime minister's official residence, and is acknowledged as the seat of the Italian government. 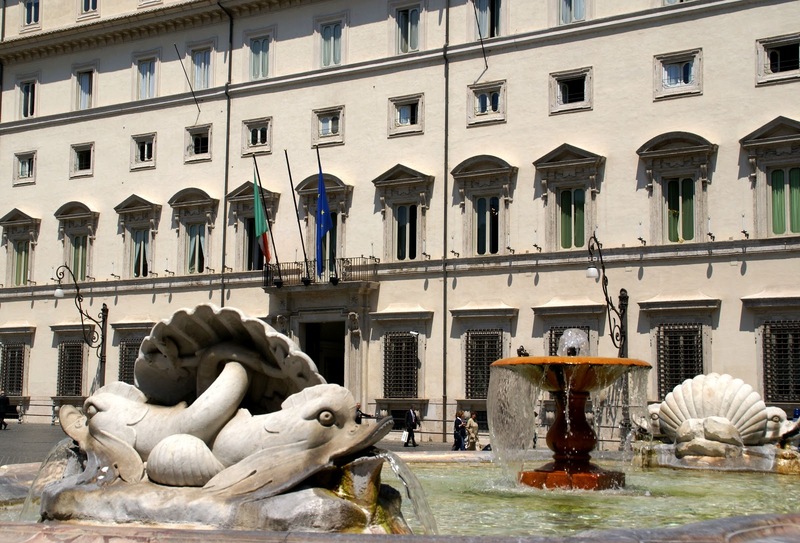 The Palazzo Chigi is a palace or noble residence in Rome, overlooking the Piazza Colonna and the Via del Corso. In 1659 it was purchased by the Chigi family. Palazzo Chigi was begun in 1562 by Giacomo della Porta. 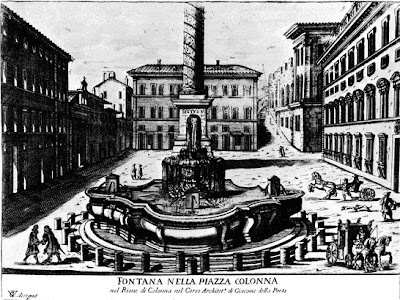 A courtyard was built that is decorated with a fountain, designed by Giacomo della Porta. 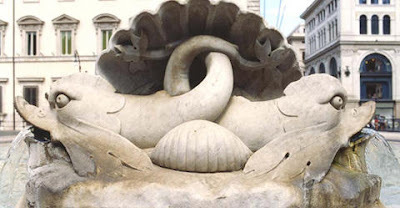 The fountain has been copied in many sites in Rome and other Italian cities. This Chigi's fountain is called the Fontana di Piazza Colonna. Why was the piazza given this name? The name of this piazza comes from Marcus Aurelius's column still standing where it was erected in ancient Rome and reminding us of the topographical changes made in the city over the centuries. 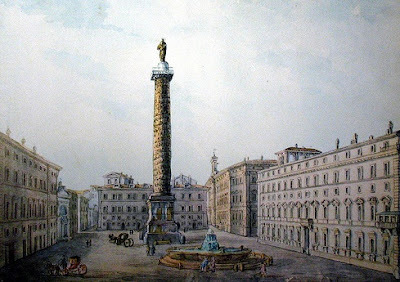 In Imperial times, there used to be a temple dedicated to the Emperor on part of what is now the piazza. Colonnades bounded two sides, with houses and shops on the Via del Corso side. The column was erected in 180 AD in the center of the temple's piazza. The reliefs narrate the imperial campaigns of the era of Marcus Aurelius and, for the first time, they were the works of actual Roman artists. Even if they are less refined than those on Trajan's column, they are nevertheless more expressive. In the Middle Ages, the piazza was at the intersection of the two most important pilgrim itineraries: one went from Piazza del Popolo to the Campidoglio and then on to San Giovanni in Laterano; the other left from Via Salaria towards Porte Sant'Angelo and on to St. Peter's. After the Renaissance when restoration work was done on the column, the piazza began to take on its present appearance. The small medieval dwellings gave way to palaces for noble families. Bars and cafés became important meeting places for citizens and, especially, intellectuals involved in city politics. Source. Where this attempted assassination took place today was designed, as noted, in 1562, by a significant historical individual. Giacomo della Porta (c. 1533 – 1602) was an Italian architect and sculptor, who was influenced by and collaborated with Michelangelo, and Giacomo Barozzi da Vignola, his teacher of architecture. After the death of Vignola in 1573, Giacomo della Porta continued the construction of Il Gesù, the mother church of the Jesuit order, and in 1584 modified its façade after his own designs. From 1573 he was in charge of the ongoing construction of St. Peter's Basilica, and later, in collaboration with Domenico Fontana, completed Michelangelo's dome between 1588-1590. 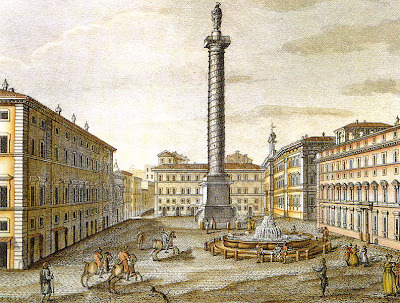 In Dan Brown's 2000 book about some of the twilight language of Rome, Angels and Demons includes a mystery murder at Giacomo della Porta's Piazza Campitelli (1589). In terms of the day, RS sends along notes on April 28th, involving three assassinations (one involving an Aurora, please note) and two shooting sprees (the infamous Port Arthur massacre and another a week after Columbine) on this date. 1996 – In Port Arthur, Tasmania, Australia, Martin Bryant goes on a shooting spree, killing 35 people and seriously injuring 21 more. 1999 – In Tabor, Alberta, Canada, 14-year-old Todd Cameron Smith fires upon three students, killing one and wounding another in the W. R. Myers High School shooting. What Logos Are On Boston Marathon Suspects' Caps?